VPN services have made an easier and comfortable browsing time for the Internet users. This service has been utilized for various purposes and most significantly, it has given users a freedom of browsing to anywhere in the cyber world. A VPN service works by encrypting the data traffic between the Internet user and the specific server of VPN which helps the user to hide their actual identity while trying to get access into some Geo-restricted zones in the cyber world. Moreover, this VPN service has been used for transferring confidential information between many of the companies due to the security issue. Besides, this service is gaining more popularity due to their privacy services to the users. VPN service helps the user to hide their real IP address and allow them to create a new one that can be connected with specific servers of user’s demand. 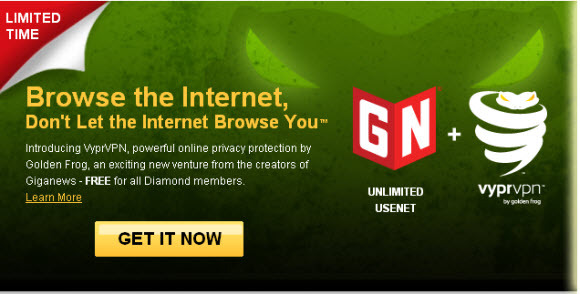 VyprVPN service is emerging as one of the best VPN service providers in the market that has been offered by Giganews which is providing top class Usenet service. Besides, this VPN service offers PPTP, OpenVPN SSL, L2TP/IPsec service to the users. However, there are some exclusive features available for the users as VyprVPN is trying to make their services as users friendly as possible. You will see that the vyprvpn reviews found on the Internet are quite favorable. The exclusive services offered by VyprVPN is listed below. This service will allow you to use the Internet service in a private system so that no one can check out your personal database. Besides, they also offer secured service for instant messaging, e-mail, newsgroup reading and many other popular services available in the cyber world. Moreover, they also provide you security from your Internet service provider and wireless connections. This service will give you the allowance of choosing an online based identity in Europe or in US. They provide protection from snooping of database and hacking of personal information while using Internet service from the public Wi-Fi spots, PDAs, iphone, iPad, and broadband Internet service. It gives all sorts of accessing to any of the popular websites available around the world. VyprVPN servers are conveniently located all over the world. The major servers are in Los Angeles, CA – USA, Washington, DC – USA, Amsterdam – Netherlands, Paris – France, London- United Kingdom, Frankfurt- Germany and in Hong Kong. If anyone wants to set a connection through the VyprVPN service, it has to be done by manual set up. The user can easily get all the detail information for setting up this service into different types of operating systems such as Windows 7, Windows XP and Mac OSX. VyprVPN also supports Ubuntu (Linux), Moreover, there are several servers have been set up in different countries, so that users can create any country’s IP address whenever they prefer to do so. Any good VyprVPN review will guide a customer with the procedure of setting up this service. VyprVPN has desktop apps for Windows and Mac. This makes setup as easy as installing the software. They also have apps for both Android and the iPhone. Every VyprVPN customer gets 5gb of free online storage with Dump Truck. From most of the vyprvpn reviews you can find that this VyprVPN service has an excellent customer support team that is thoroughly professional with work and if any of the user asks for any sort of queries, they will try to provide information related to the queries within 10 minutes. If you prefer to sign up for this VPN service, you can certainly do that within very short time as this company offers instant account activation for the new users. All the transactions are being processed automatically and new users get their login information within few minutes after registering to the service.